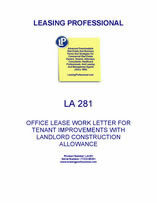 Lessee and Lessor are executing simultaneously with this Work Letter Agreement, a lease (the Lease) of even date herewith covering certain Premises described in the Lease. This Work Letter Agreement is incorporated into said Lease as Exhibit B thereto. In consideration of the mutual covenants contained in the Lease, Lessee and Lessor hereby agree that the Premises shall be improved as set forth herein. 1. BASE BUILDING: Lessor and Lessee understand and acknowledge that this Work Letter Agreement relates only to the construction of non-base building improvements (Lessee Improvements) for the Premises. Base-Building improvements are those that constitute the Building as of the commencement date of this Lease. 2. FINAL PLANS: Lessor shall prepare or cause to be prepared (by ____________, as architect, and __________________, as structural engineer, final plans and specifications for the Lessee Improvements. Plans shall hereinafter mean final plans as may be changed from time to time in accordance with Paragraph 7 below. All Plans shall be delivered to Lessee as soon as reasonably possible from the date hereof, subject, however to periods of delay encountered by Lessor in the preparation of Plans resulting from requests by Lessee for changes in the Plans subsequent to the date hereof. Lessor and Lessee hereby agree to act with diligence to cause the Plans to be approved and signed by the parties, in duplicate, as soon as possible, but in no event more than ten (10) days, after delivery of the Plans to Lessee. Following such approval and execution of the Plans changes may be made only in accordance with Paragraph 7 below. In the event that Lessee fails to approve the Plans pursuant to the provisions of this Paragraph 2 and as a result of such failure this Lease is terminated, unless such failure is due to Lessor’s unreasonable act or omission, Lessee agrees to indemnify Lessor for any and all nonreimbursed expenses, including, but not limited to, architects fees, engineering fees, non-refundable good faith deposits and attorneys fees incurred by Lessor in connection with the preparation of the Plans and construction of the Premises. 3. CONTRACTING PROCESS/IMPROVEMENT BUDGET: Lessor, acting through ________________ , and Lessee, acting through ___________________ (the Lessor and Lessee Representatives), will, as soon as reasonably possible after approval of the Plans by both parties, agree on a general contractor to build the Lessee Improvements under the terms of a guaranteed maximum price contract. The general contractor shall be chosen after the Lessee Improvements project is bid by at least three (3) general contractors chosen by Lessor and Lessee. The successful bid will not necessarily be the lowest in fee alone, but rather the one providing the best overall value in the judgment of the Lessor and Lessee Representatives. The bids shall include the use of the subcontractors chosen by the parties, as provided for in the following paragraph. Lessor shall enter into a guaranteed maximum price contract with the chosen general contractor for the construction of the Lessee Improvements in accordance with the approved budget attached to the contract (the Improvement Budget). The Improvement Budget shall be a detailed estimate of the Costs of the Lessee Improvements, which Costs shall include, in addition to specific work, those elements described in the definition of costs set forth in Paragraph 4 below. In no event shall the final Improvement Budget exceed the Improvement Allowance (as hereinafter defined) without Lessee’s prior written consent. Changes to the final Improvement Budget may be made only in accordance with Paragraph 8 below. As soon as possible after execution of this Lease by both parties and selection of a general contractor, the Lessor and Lessee Representatives shall submit bid specifications to not less than two (2) agreed upon design build subcontractors for each of the mechanical, electrical and plumbing work requirements of the project and shall choose one such contractor for each area of the work. All other subcontracted trades shall be competitively bid to at least three (3) qualified subcontractors by the chosen general contractor.